While Memorial Stadium is getting ready to debut its sparkly new self this fall, some people are polishing up the bits it shed along the way to sell to the public. According to Today’s THV, Eric Gellerman, who runs The Wooden Duck — a recycled wood furniture store in Berkeley — has nearly 90 percent of the old stadium in his shop. 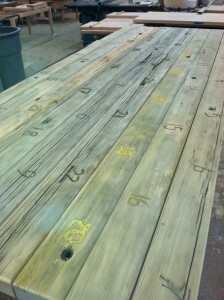 He is using the old stadium bleachers to make conference tables, coffee bars, clocks and other wooden bric-a-brac. Gellerman is planning on selling the pieces to grads who want a piece of their alma mater and also to local shops who can use them for marketing to their Cal audience. Even though the stadium bleachers held up crowds of people every year they are still structurally sound. All right Cal Bears, time to start planning for the future by getting a bit of history in your home.